ATTENTION: Booking must be made 3 WORKING days in advance. Kindly note that this is a SkyVans Booking Request only. Your booking has not been yet confirmed. You will be contacted by SkyVans representative by e-mail within 1 working day with more details and booking confirmation. Kindly note that this is a SkyVans Booking Request only. Your booking has not been yet confirmed. You will be contacted by SkyVans representative by e-mail within 1 working day with more details and booking confirmation. 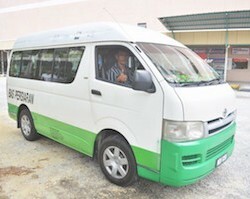 You will have the 8-seater van or 10-seater van to yourself. If a booking is cancelled under 6 hours of pick-up time, a cancellation fee of 10% of total fare is charged.